Kenton Lee, an Idaho native, was living in Nairobi in 2007. As he looked around, he noticed how many children were walking around barefoot or wearing very old shoes that didn’t fit anymore. He soon realized this was a bigger issue and the people living in these areas could not afford to continually purchase shoes as kids’ feet grew. 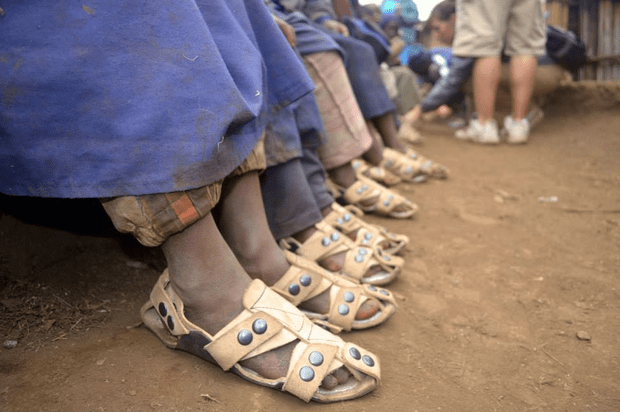 According to his site, The Shoe That Grows, over 300 million children across the world do not have shoes. Kenton set out to create a shoe that could easily grow with a child. The shoe he devised is quite amazing. It will grow 5 sizes and last for 5 years. There are two versions of the shoe. Theshoethatgrows.org is currently accepting donations. The shoes purchased will be sent to children in need across the globe. You can go to here to donate a pair of shoes for $15. The shoes will then be placed into duffle bags and sent over to kids in specific countries.